In our opinion most of the threads can be put into multiple categories. 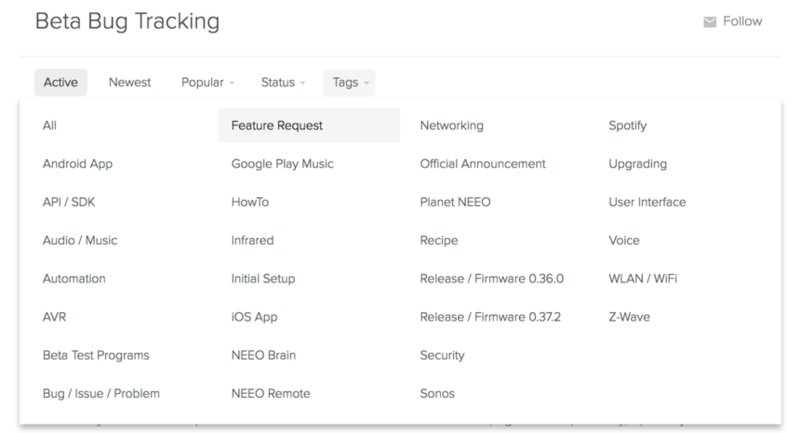 As an example, lets say somebody writes a howto on a work around for Sonos to get playlist from Google Play Music working on NEEO. Now, does this belong in the category "Music", "HowTo", "Google", "Audio", "NEEO Remote", "Work Around" or "Bugs"? For this reason we decided to use Tags in addition to categories. You can assign multiple tags when you open a new thread, and we ask you to do so. These tags are also shown on the right side of Planet NEEO, and they appear as well when you use the search function. Whenever you think a new tag is needed, let us know. However, an update to Planet NEEO is coming up which will implement a few more categories. It is a good approach, but a i do myself, opened a new Bug Thread because overseen the other one (Panasonic TV issue), is there a Way for you to search for existing Threads when opening a new and type in the Title? @ NEEO Team: i see a lot of ppl. having individual issues with their devices and it's spread in the general discussion or bugs. maybe it's just me, but i'd like to see a section or so where ppl. can post their "my device xy doens't work", which would not flood the rest of the threads, or is the general thread made for that? Patrick Domenig The Z-Wave tag is used in two post at this time, but does not appear in the list of tags on the right / bottom of the page as well as in the menu. 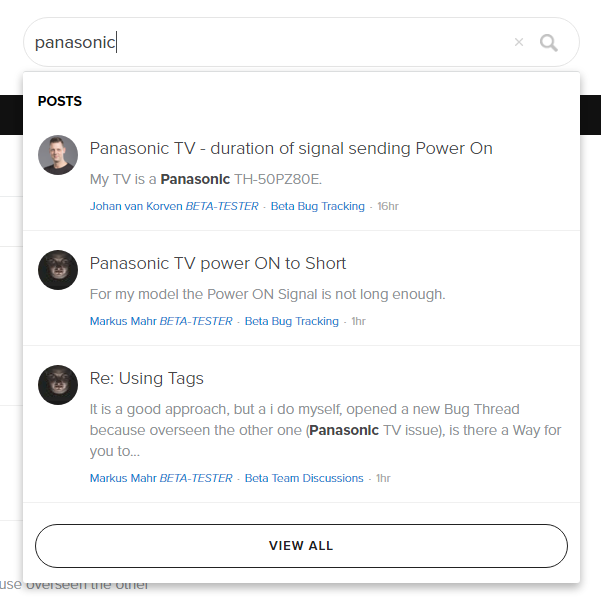 A nice feature of the Beta Bug Tracking forum is that the posts can have a status such as FEATURE REQUEST / ACKOWLEDGED / SOLVED. 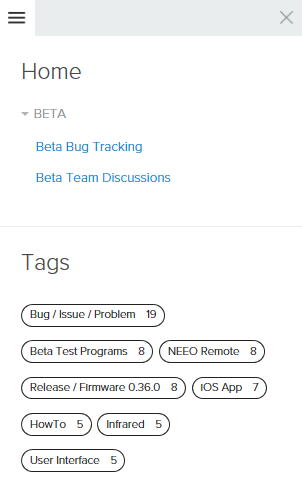 I can see that some people are reporting bugs in the Beta Team Discussions forum and I recommend them to post under the Beta Bug Track forum. Patrick Is it possible to add a Tag Feature Request? So it is easier for everybody to Find these Topics and Check / Support them? Markus Mahr When you are in the Bug Tracking Section of Planet NEEO you can use the filter on top to see all threads which have been marked as Feature Requests. Or just click this link. Do you think the tag is additionally required or useful? Patrick at first entry this filter is not working, because you ( or an other Team member) must set the topic to this. But when that's OK for you, I will be fine with that. If a tag exist, it can be tagged faster and with less work, I'd think. Sorry Paul Spee for the late answer. In the left menu and the right overview only the tags with the most threads are shown. A complete list of tags can be seen when using the filter.